Using a "Hyper-V" feature, you can save any number of Hyper-V virtual machines from one physical node. This is no need to install a copy of Handy Backup into a machine to make this plug-in works. It is to be mentioned the specialized Hyper-V servers have no GUI to operate with standalone editions of Handy Backup. Therefore, the most convenient way to use Handy Backup and a Hyper-V tool is to install a Network Agent on a Hyper-V physical server, linked to a Management Panel somewhere else. 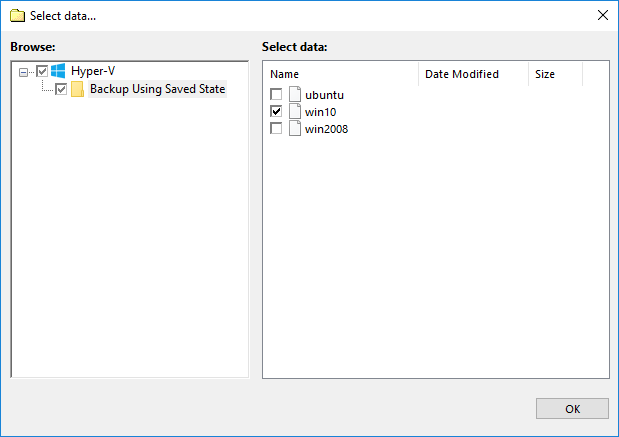 Starting from Handy Backup 7.7.7, you have a capability to install a standalone edition of Handy Backup on a Hyper-V host and set it up using a standard GUI. Note: For any practical purposes, backup from standalone is almost identical to the process described here. Just skip the selection of a remote machine. On a Step 2, choose the "Hyper-V" feature on the left panel. Click on a machine server name appeared on the right. A new window will appear. Select any virtual machines you will plan to back up with the new task. Note: this plug-in makes snapshot of particular virtual machines, not of entire arrays. To back up all Hyper-V machines on the server, please select them all, not just mark a "Hyper-V" on the left panel. Press "OK" when you finish selecting data, returning to the task creation window. Now you may select where your backups will be placed. 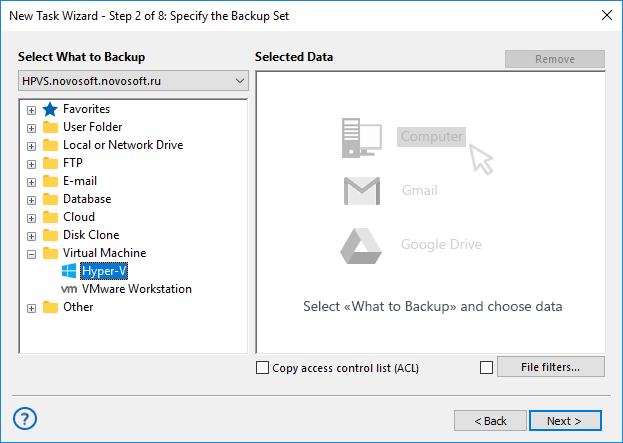 Set up other task parameters, such as encryption and compression; choose the backup type, control pre- and post-actions within the task, etc. Finish the task creation wizard. Your Hyper-V backup task is ready to use. Open a New Task Wizard. Select Restore task, and then click Next. Browse for the index file (backup.hbi) located in the destination folder. Select it, and then click the "Next" button. Skip the next steps by clicking Next, until you finish the task creation. When you run the restoration, the plug-in firstly stops the current instances of Hyper-V machines and all Windows services that depend on it. Then it copies the files to their original locations, and re-launches the services. Read more about Hyper-V Backup Software features.